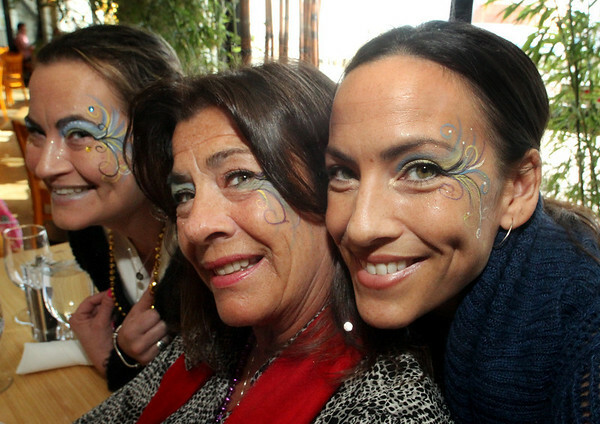 Sporting delicate face art are, from left: Caroline Forsyth of Gloucester, mom Carol Quadros of Gloucester and sister Christina Godfrey, originally of Gloucester, now of Peabody. They were participating on Tuesday during Mardi Gras festivities and the Cape Ann YMCA's full day fundraiser at Latitude 43. The fundraiser is for Y teens and chaperones to travel to and volunteer in New Orleans during April school vacation and help rebuilt homes destroyed by Hurricanes Katrina and Rita.